Sound | Sensory play | KaBOOM! Singing silly nonsense songs and making echoes in closed spaces is as much a part of play as baby dolls and toy trucks. Children develop a variety of skills by experiencing and creating different sounds. They refine their ability to communicate, hone their literacy skills, and experiment with cause and effect. Quiet and loud noises, pretty and ugly noises, hums and buzzes—children make these sounds and watch eagerly for a reaction! Landscape architect Rusty Keeler reminds us that while we tend to be a visual culture, sound has a tremendous effect on us. 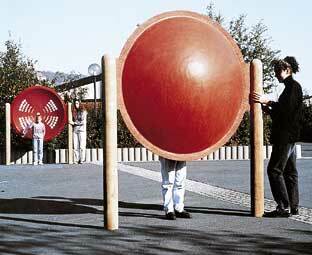 * He considers sound to be a backdrop to play, a by-product of play, and a goal of play. Take a few simple steps to make your playspace conducive to sound play. Let children play CDs, the radio, or cassette tapes. Include musical instruments: a donated piano, bongo drums, a xylophone. Select toys and games that beep, squeak, honk, and squeal. Encourage the exploration of sound when children play by joining in the noisy fun. Sing lots of songs, hum a goofy tune, make frequent noises yourself, and respond to their sounds. Use lots of repetition and rhyming to aid memory and help children learn their ABCs. Sounds will also enhance play for children with visual and certain cognitive impairments.